Neutrogena wanted to advertise its new Beach Defense sunscreen during sunny days, but didn’t want to limit its media to weather forecast apps. 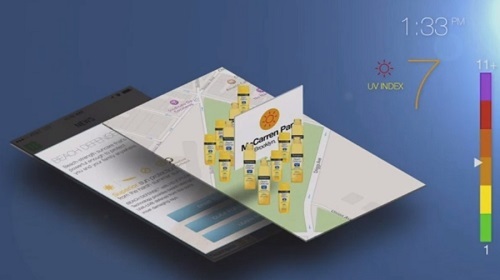 By combining weather- and location-based technology, the brand automatically activated its ads based on real-time UV conditions and distance from Neutrogena retailers to create a relevant, engaging campaign that drove awareness and sales. In 2013, Neutrogena set out to launch its new sunscreen line, Neutrogena Beach Defense. Faced with the challenge of breaking through an already cluttered category, the brand focused on activating its mobile campaign based on the ideal weather conditions. However, conventional weather targeting required placing the brand in lackluster environments where users were typically spending mere seconds with the content. Neutrogena described its target audience as “proactive everyday protectors,” women 25 to 54 years old, who are very aware of the damage the sun can cause but still enjoy spending time in the sun with their children. They are careful to protect themselves and their families on a regular basis to ensure that they are safe from the dangers of the sun. Rather than running the campaign on mobile weather apps, the brand sought to deliver its Neutrogena Beach Defense ads only when the sun was shining, and concentrate the creative in ideal locations during the day when sun protection is top of mind. By combining weather and location cues, the brand could adapt to real-time triggers, only targeting its audience at appropriate times. Using weather- and location-based technology allowed Neutrogena to be strategic about its media budget. The campaign took a number of factors into account before pushing an ad unit, which was dynamically created based on distance to a retail location, time of day, and surrounding area. 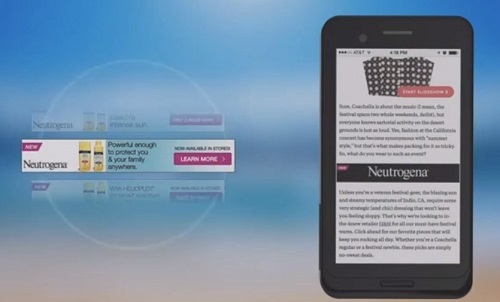 Neutrogena developed an advanced mobile campaign that allowed real-time UV conditions to automatically activate the Neutrogena Beach Defense ads. Essentially, Neutrogena Beach Defense ads would “follow the sun” across a rich variety of beauty or lifestyle content popular with the target audience. To further enhance the campaign’s effectiveness, the brand layered custom location data in areas of prolonged sun exposure such as parks, beaches, and pools. This allowed Neutrogena Beach Defense to have a dominant presence in key out-of-home locations when the weather was ideal. The primary objective of the campaign was to increase purchase intent, so the brand added geo-fencing that would dynamically replace the click-through to the brand site with directions to the nearest store and a coupon offer when audience was near key retail locations. The campaign was one of the first in the industry to utilise weather targeting without limiting the choices of where the brand could advertise. More importantly, it was successful in launching the new Beach Defense brand into a highly competitive category. Within the first few months of launch, the mobile campaign exceeded expectations in awareness and intent to buy.